Allen and Cindy have joined their talents in forming The "MILLER GOLF GROUP". With their combined years of playing the PGA Tour, the Senior PGA Tour, the LPGA Tour and the Womens' Senior Golf Tour, Allen and Cindy bring to you a husband and wife team with 20 years of marriage and three children for a co-educational learning experience. 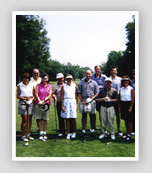 Offering Corporate Outings, "Lessons On The Links", TPC Dream Trips and other programs for the BEST of BOTH a man's and woman's world, they can make your co-educational experience fun and meaningful. For more information: Please contact Allen or Cindy.